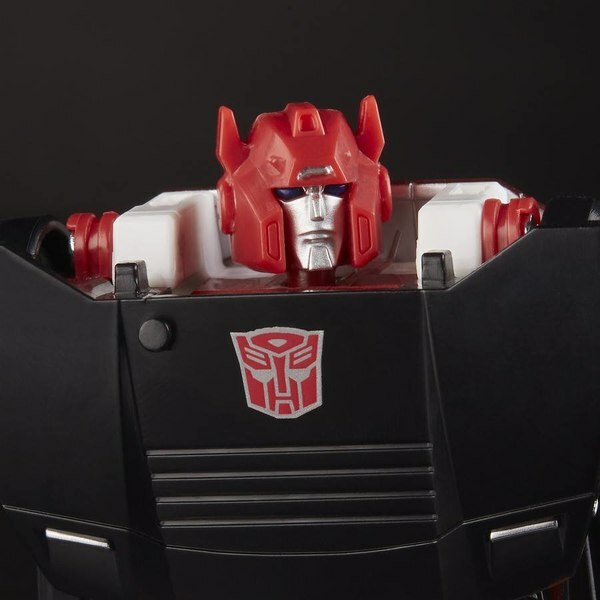 In a world or Powerlinxing Autobots, Terrorcons, and an endless sea of repaints, 20th Anniversary Optimus Prime comes along to remind us where it all started and in a big way. You could say that this is the toy people have been waiting 20 years for and you wouldn't be far from the truth. 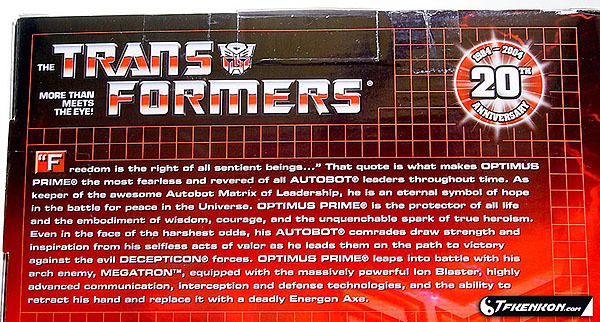 From the back of the box: "Freedom is the right of all sentient beings..." That quote is what makes Optimus Prime the most fearless and revered of all Autobot leaders throughout time. As keeper of the awesome Autobot Matrix of Leadership, he is an eternal symbol of hope in the battle for peace in the universe. Optimus Prime is the protector of all life and the embodiment of wisdom, courage, and the unquenchable spark of true heroism. 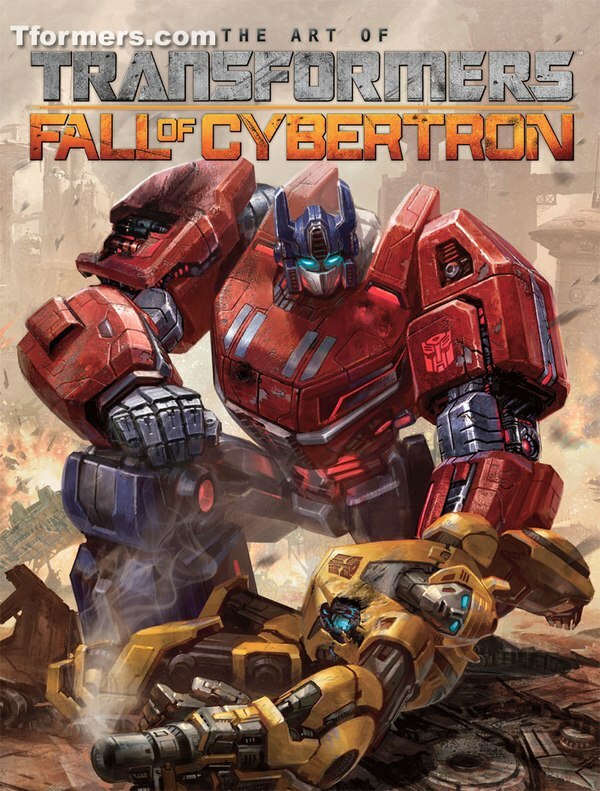 Even in the face of the harshest odds, this Autobot comrades draw strength and inspiration from his selfless acts of valor as he leads them on the path to victory against the evil Decepticon forces. Optimus Prime leaps into battle with his arch enemy, Megatron, equipped with the massively powerful Ion Blaster, highly advanced communication, interception and defense technologies, and the ability to retract his hand and replace it with a deadly Energon Axe. A unique toy needs a unique box and Optimus Prime is no exception. At over 15 inches in height, this box is decked out in G1 style and has a huge window showing off the Autobot Commander. 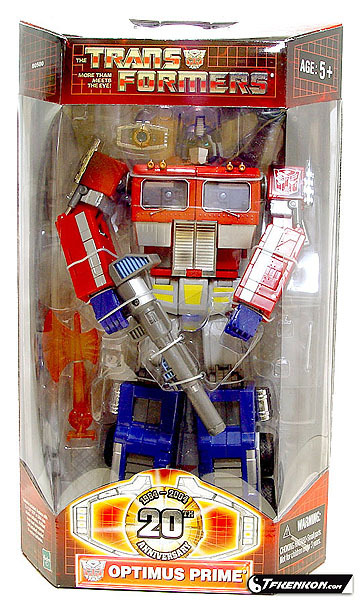 An Autobot logo is printed on the clear window on the top of the box, surrounded by a red grid system with red lightning throughout. Just below, on the front of the box, if the G1 Transformers logo. Imprinted on the box near Prime's feet is a Matrix with the words "1984-2004 20th Anniversary" all in foil lettering. 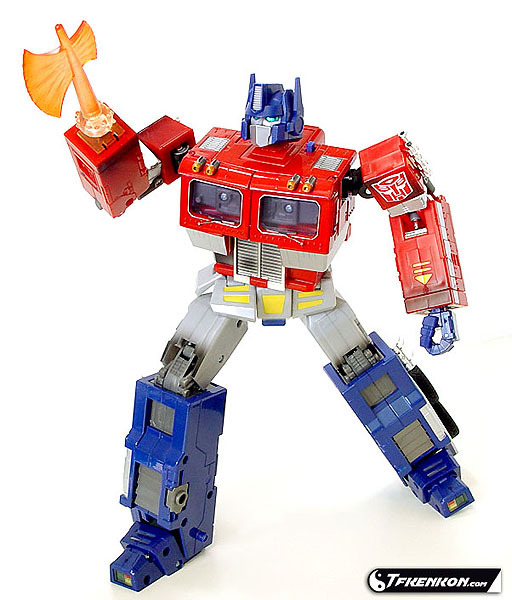 Below, a foil Autobot symbol is alongside Optimus Prime's name. 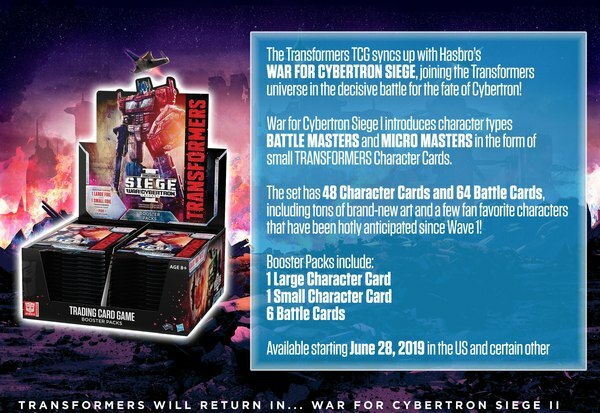 The back of the box features the above text and pictures Optimus in both modes surrounded by yellow lightning and orange blocks. The same grid pattern is present going from a dark background at the top to the lightning variety surrounding the pictures. 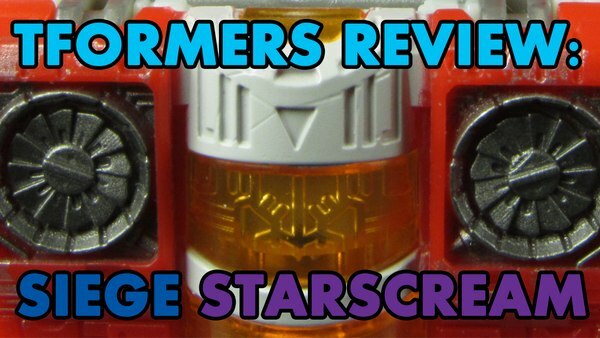 A ghostly red Autobot logo rests to the right, above the truck mode picture. Through the gigantic window stands Prime. He is holding his rifle, in this case it is gray rather than black. To the left of his head is the Matrix of Leadership. To the left of his legs is the Energon Axe. Above Prime's head is the anti-matter gun, Megatron, with silencer, scope, and stock. The stock is bent down on a hinge to fit in the tray. 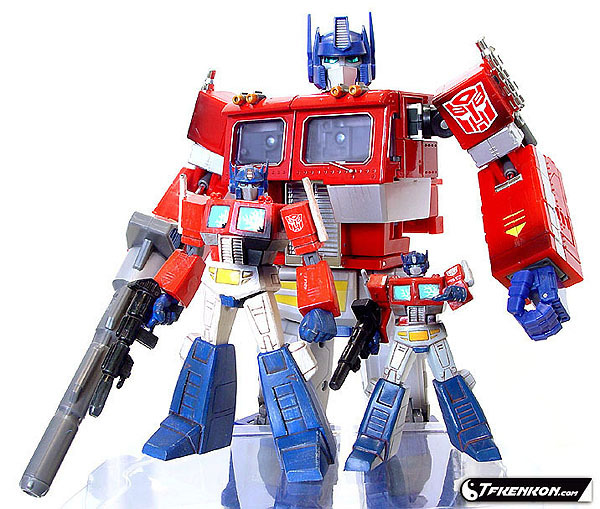 The side panels show off the features Prime has. The right one shows the Matrix, the opening windows to reveal said Matrix, the light-up Matrix Annex, and his DataCom Interfaces. The left side panel shows the Megatron pistol, Ion Blaster, Energon Axe, and the Turbo Contact Support Extensions and Superstructure of the rear wheels. 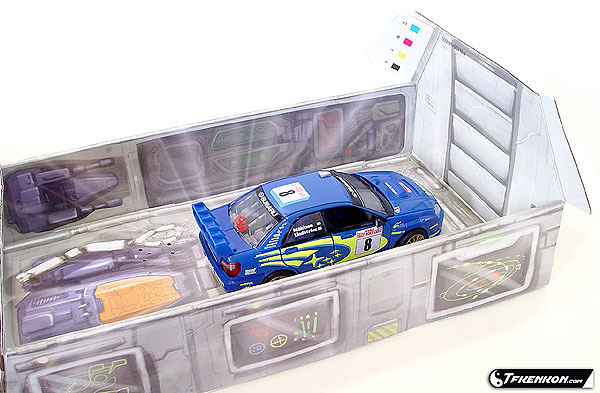 The interior of the box should be familiar to anyone whose ever owned the original Optimus Prime. It resembles the Combat Deck from the original Prime's trailer, complete with crane arm and side panel details. 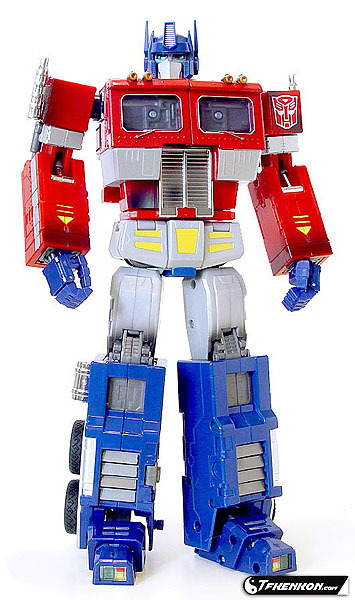 Standing just a couple hairs under 12 inches, Optimus Prime is a magnificent piece of engineering. His head is typical for Optimus Prime: blue helmet, gray face, mouth plate, and vent. His eyes are a metallic light blue. His upper torso and arms are mostly red. Two gray vents, one on either side of his head, reside on the top of his torso. Above each window are two gray mounts with orange, nonfunctional lights. The windows are lined in silver with one gray wiper on each. His mid-section has the typical silver stripe separated by the chrome grill in the middle. Blaster damage is visible on his right side, below the stripe, and grill. 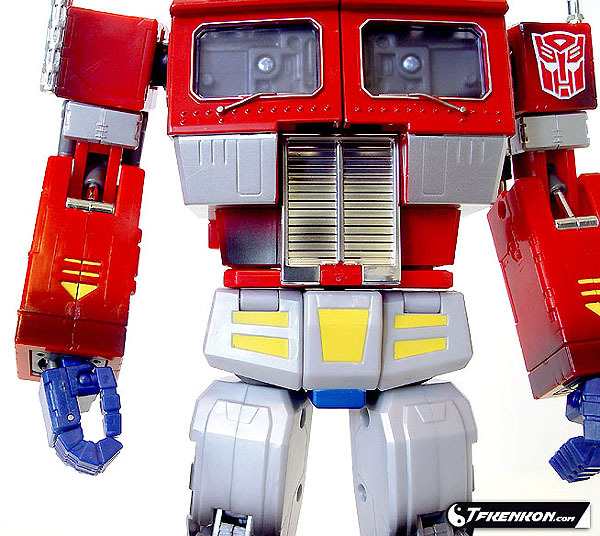 Prime's left shoulder has a molded-on Autobot insignia painted red with a white border. Scorch marks surround the insignia in a right-to-left angle. Each arm has a chrome smokestack on the side. These are on springs so that in case you push on the top of them, the entire stack moves slightly. These are much nicer looking than the longer stacks of the Japanese version, judging from the pictures I've seen. Each forearm features scorch marks on the front-most portion of the arms. Unlike the original Prime, silver stripes line a portion of the outer sides of the forearms. 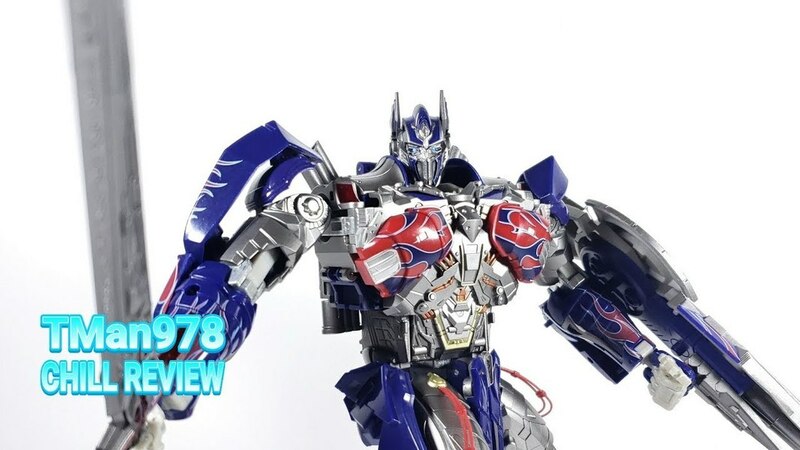 Prime also has two yellow stripes and a triangle pointing towards his hands. And speaking of those hands, they feature an amazing amount of articulation. Each finger bends at the back-most knuckle and the thumb is on a ball-socket joint. 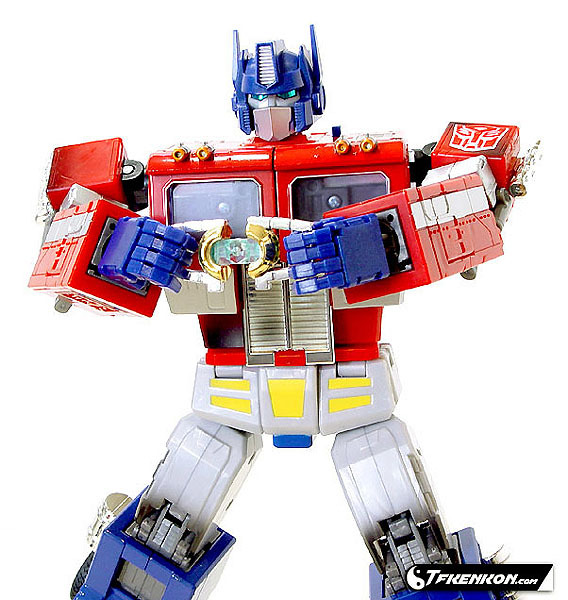 So, Prime can give the thumbs-up sign, The wrists rotate 360 degrees and pivot side-to side with the help of some pistons. The elbow joints also have pistons: one in the front and two in the back. Along with a swivel joint, this allows for nearly a full-range of motion. The shoulders rotate and bend as well. Prime's head is on a ball-socket joint, allowing for a wide range of positions. Clearly, this is the most expressive Transformer ever designed. The lower torso and upper legs are a light gray with some yellow highlights on the cod piece. The lower legs and mostly blue with silver fuel tanks and hubcaps and light and dark gray paneling and detailing. The front of each foot have green lights on the outside and red with yellow lights on the inside. Prime rotates at the waist and has a plethora of articulation points throughout each leg. The toes, ankles, and knees bend. Each hip rotates 360 degrees and can be positioned forward, back, and out to the side. Starting with the head, the first of Prime's many gimmicks is a small button on the back of his head. Pressing this will cause his mouth plate to move down. Pressing repeatedly will result in a talking motion. The antennas also move back and forth. This is mainly for the transformation later on, but it can help give mood to Prime. Position them forward for an angry Prime, back for a happier Prime. Next up is the opening chest. It splits open down the center and opens outward. Some dark gray paneling is now shown. Open that up to reveal the Matrix Annex. Pressing the button to the left of Prime's head back will activate the light in the center of the annex. The Matrix, which can open and close, fits in the center quite snugly and will light up as well when the button is pressed. Unlike reports I've read on the Takara version, there is no problem with placing and removing the Matrix while in robot mode. Prime can also hold the Matrix with both hands as though he were opening it up to end the Hate Plague. On the outside of each forearm is a small panel that can open up to reveal a DataCom interface. The inner panel is dark gray with white-painted buttons. On the flip-up screens are one of two characters. The right arms shows Starscream while the left shows Bumblebee. One has to wonder if Starscream is up to something by calling Prime. Could this be another plot to replace Megatron as leader of the Decepticons? Next up are Prime's weapons. He can hold his Ion Blaster in either hand. Make sure you push the fingers against the handle well and the thumb across the side or the blaster will fall right out of his hand. The Megatron gun can be held with or without the accessories by simply sliding the handle down slightly. It is a faithful representation of the original Megatron's Walther P-38 form right down to the little purple Decepticon emblems above the trigger. 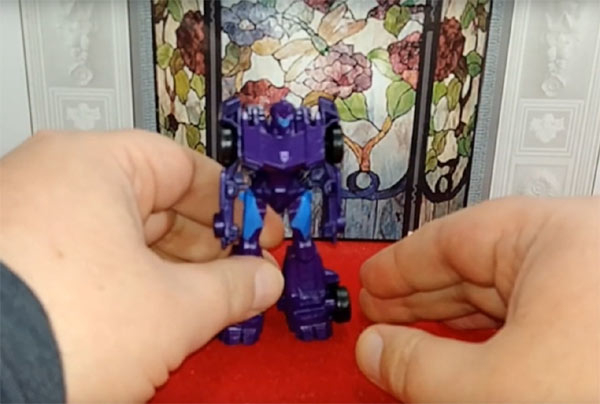 To attach the Energon Axe, slide one of the hands into the lower arm by positioning the fingers with the thumb pointing down and the four fingers curled in. Swing the panel on the underside of the arm down, then pull it back to retract the hand. Then lock the panel back into place. The axe can rotate at the base 360 degrees. Retract each hand into the lower arm as described above and turn the upper body around 180 degrees. Press the lower portion of each fuel tank on the sides of the legs and slide the lower legs up. Swing the middle portion and heel of each foot up. Rotate each foot around 180 degrees and swing down the middle portion of the foot. Connect the two legs together, but at this point, you have two choices: either swing up the gray tab in the center that forms the trailer hitch or leave it down. 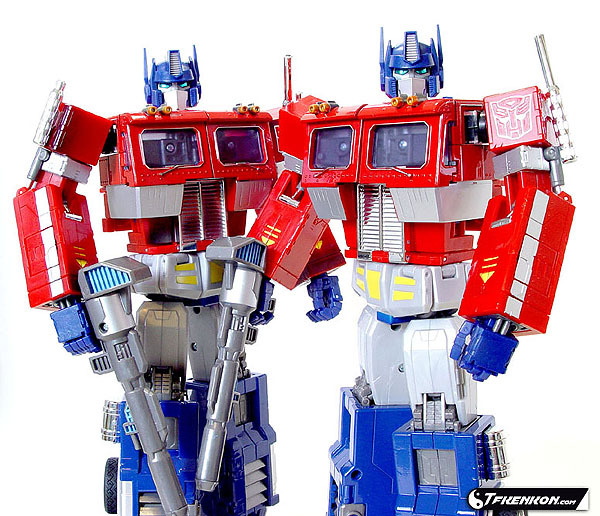 Separate the two panels linked at the center on Optimus' back. Open up the chest panels and flip the grill down and swing the lower body back. 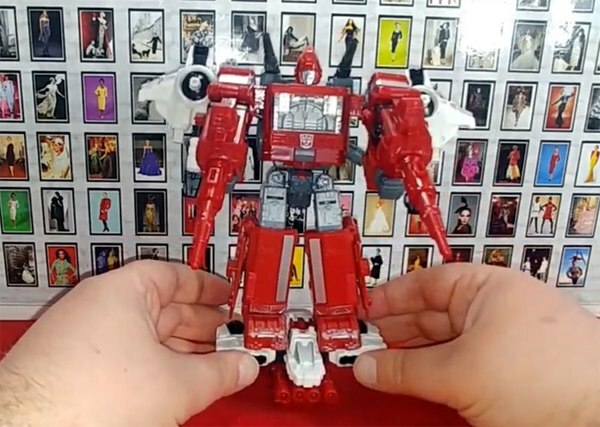 Fold the silver sections on Prime's chest down to the sides. Rotate them so the headlights of the truck mode are facing the front. Flip the panel that guards the Matrix up and rotate it around 180 degrees. Pull that panel out and the Matrix chamber will become loose. Rotate the Matrix Annex, turning the left side down. Swing the Matrix Annex down to reveal that the panel that protected the Matrix is the front bumper and grill section of the truck. Attach it to the lower part of the headlight panels. Open up the square, back panel, behind Prime's head. 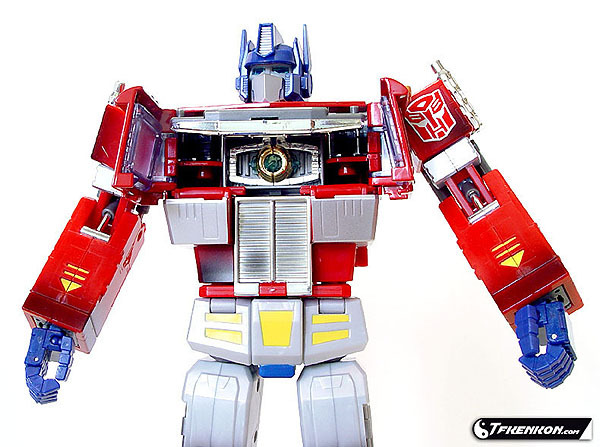 Swing Optimus' antennae back and then flip the entire head section 180 degrees, placing the head inside the chest. Flip the gray seat up. Bring the forearms up and swing the shoulder sections back. Next, bring the lower arms forward. Swing back the panels atop each front tire and close the windowed chest panels. 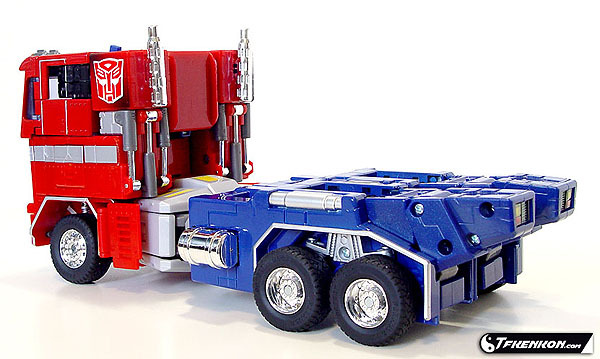 In vehicle mode, Optimus Prime is 9 1/2 inches long, 3 1/4 inches wide, and 4 1/2" high to the top of his smokestacks. 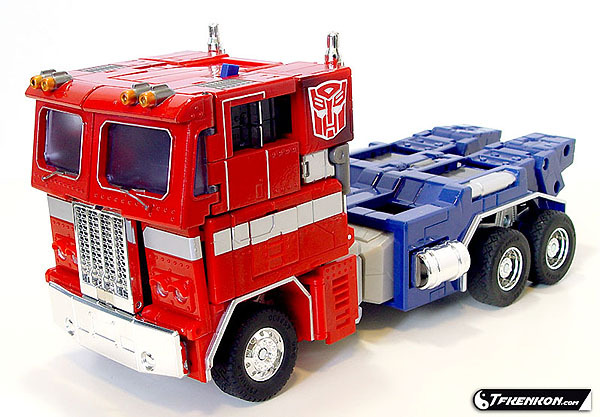 Optimus is a flat nose semi-truck, somewhat resembling a merger between his cartoon model and his original G1 toy. The front bumper and grill are completely chrome and the four headlights are a clear plastic with either a white or gray dot painted behind them. From the back view, the elbow pistons are visible and the shoulder joints are somewhat visible on the upper portion of each side. The tail lights are in their proper alignment with the yellow turn signal on the upper outside and the brake light on the lower outside. The rear wheel sections feature the aforementioned Turbo Contact Support Extensions and Superstructure, shock absorbers to you and me. the 20th anniversary edition of Optimus Prime is an excellent toy. 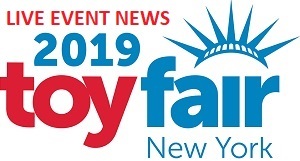 Though it is designed with the collector in mind what with all the die-cast metal and the high price point, he also has a number of fun play features. Though some may not enjoy the shorter smoke stacks and scorch marks, I prefer these over the Takara version based on the pictures I've seen. 20th Anniversary Optimus Prime gets my highest recommendation.